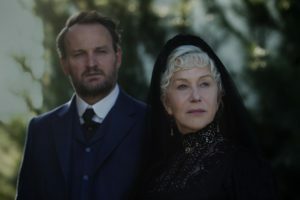 Winchester was originally mentioned in my to-watch list in this post. So far, I’ve also reviewed Into the Forest, Annihilation, and Coco from that list. A content warning for anyone who is sensitive to this topic: this film does contain a few brief references to the death of a child, but I will not be discussing that part of the plot in this post. This will otherwise be a spoiler-free review. The real-life Sarah Winchester lived from about 1840 to 1922. (The exact year she was born is unknown, but it is generally thought to have been between 1835 and 1845). She was the heiress of the Winchester Repeating Arms Company. I’ve long been interested in the story of why she began adding so many rooms to a mansion that eventually had seven floors and a couple of hundred rooms. Some people have speculated that she was expressing an interest in architecture in the only way she could at a time when such a career was forbidden to women. 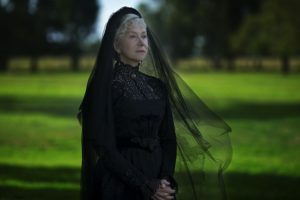 Others have passed around legends about Mrs. Winchester believing she was haunted by the ghosts of people who were killed by Winchester rifles. They’ve wondered if Sarah’s mansion had so many staircases that lead to nowhere, hidden rooms, and other architectural oddities in order to confuse the spirits and prevent them from harming her. We’ll never know for sure why she spent so many years building and tearing down sections of the Winchester mansion, so this film took these nuggets of truth and spun them into a full-fledged ghost story that is only somewhat related to the actual events of this woman’s life. I only knew a few details of the original legend when I first heard that this movie was being made, but it was more than enough to convince me to watch it. If you’re interested in learning more about the real Sarah Winchester, the links above will give you factual information about her life. There are a few plot points from the film that ended up mirroring the truth, though, so be cautious about clicking on those links if you’re a stickler for avoiding all spoilers ahead of time. Eric Price, the protagonist and a medical doctor who lived at at time when psychiatry as a distinct type of medicine was still in its infancy, was hired by the Winchester Repeating Arms Company to determine whether or not Mrs. Winchester was mentally fit to continue running the company she’d inherited. Some of the other stills featuring this character reveal huge plot twists, so be cautious about googling him before you watch Winchester. Sarah Winchester owned half of the Winchester Repeating Arms Company. This character lived with an overwhelming sense of guilt over the deaths of all of the people who had been fatally shot by Winchester rifles. She used some of the profits she earned from her successful business to add, renovate, and remove rooms from her massive mansion twenty-four hours a day in an attempt to help those restless spirits find peace. Marion Marriott was Sarah Winchester’s loving, protective niece. Marion had been recently widowed, and her son, Henry, was still grieving from the loss of his father when the events of this film began. 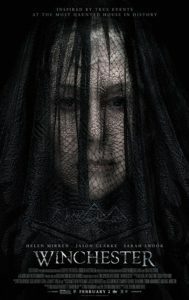 Originally, I was quite excited to watch Winchester. There’s something about knowing that a film was inspired by the lives of real people that makes it even more appealing to me than it might otherwise be. (I should warn you again that the screenwriters took a lot of liberties with the original story, though! This wasn’t a biography by any means, but given how many contradictory facts there are about Sarah Winchester’s life and unusual hobby that ended up being a good thing). With that being said, there were some pacing problems. The Winchester mansion filled with restless, angry spirits, but there weren’t quite as many scenes about them as I was hoping to see. Yes, the setting itself was incredibly spooky. There were multiple times when the Dr. Price took a wrong turn and suddenly realized that the architecture of the house lead to quite a few dead ends. I was creeped out at the thought of trying to open a door that wasn’t actually meant to open or climb a staircase that didn’t go anywhere after all. It would have been nice if such a scary setting had been matched by ghosts who were a little more active in the beginning and middle of the plot. It was nice to have hauntings that weren’t gory, however. It’s been my experience that many modern ghost movies assume the audience want to be frightened by dumping a lot of gory scenes into the plot regardless of whether or not such a thing actually makes sense for the characters or storyline. This is appealing to some viewers, of course, but I prefer a less bloody approach to the horror genre in general. 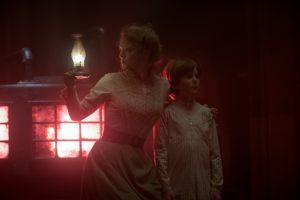 The fact that Winchester relied on building a deliciously creepy atmosphere and asking the audience to silently dread what might happen to the characters next without showing anything gruesome was refreshing. I would have liked to see the characters behave a little more intelligently once they realized they were in danger. Yes, horror movies do depend on their characters making terrible decisions in the beginning for the sake of giving the plot an adequate amount of time to put them in mortal danger and frighten the audience, but I kept shaking my head at the silly choices Dr. Price and the other members of the household made after they realized just how much they’d underestimated their foe. There were several subplots dealing with grief and regret that I thought were handled nicely. While I can’t go into much detail about them without giving away spoilers, I will say that every single main character in this film was dealing with a loss of some kind. Most of them had not processed that grief, and the weight of those unexamined emotions was heavy. Watching for the gradual exposure of their backstories was rewarding. It was these subplots that kept me watching until the end. While I was curious to see if the ghosts would become more active, I was honestly far more interested in finding out how or if the characters would resolve their complicated feelings about their pasts. If you love paranormal movies that are loosely inspired by the lives of real people, go for it. This may not be so intriguing for anyone who isn’t already a huge fan of this sub-genre, however. Winchester is available on Netflix and iTunes.